Re-engineered intake manifold kit that replaces the original Ford Motor Co. unit that was prone to cracks due to the all plastic design. This intake kit has a reinforced aluminum coolant crossover which eliminates repeat failure due to corrosion and vibration. Kit comes with instructions, intake manifold, redesigned alternator brackets, new thermostat, o-ring seal, and integrated intake gaskets. 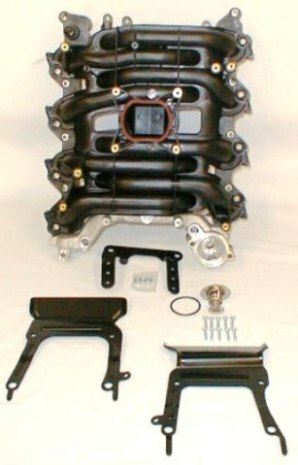 Manifold is Made in U.S.A. This kit fits the 4.6 liter V-8 in the following vehicles.